This soup is tart, just sweet enough, and hearty, though not a protein powerhouse. If you want to pump up the protein, increase the walnuts or serve with a salad of greens, nuts, and goat cheese. Line a rimmed baking sheet with parchment paper. Place beets and carrots in a bowl. Drizzle with 1 1/2... Cut the beets into uniform cubes, as uniform as they get of course. Aim for half-inch cubes. Aim for half-inch cubes. Toss them with enough light olive oil (or your favorite high-heat oil) to fully coat each cube and dust with some sea salt or zaatar. Then remove the shell from the egg, cut the egg into small pieces and place into the pot with the soup. Wash a cucumber, peel, and cut into small slices. Then wash the scallion and cut into small slices.... Prepare the vegetables: chop the onions and garlic; peel the beets and potatoes, then cut them into large chunks. Heat the butter and oil in a saucepan over medium heat. First, peel the beets and cut them into small chunks. Preheat the oven to 350 degrees. Place the beets on a sheet of aluminum foil brushed with olive oil and add any seasoning of your choice to the beets. Set 1/2 cup of cooked beets aside. Cut into cubes and set aside. In a blender, puree the soup until smooth. Adjust the seasoning. Add the diced beet to the soup. Cool and freeze at this step. Cut into cubes and set aside. 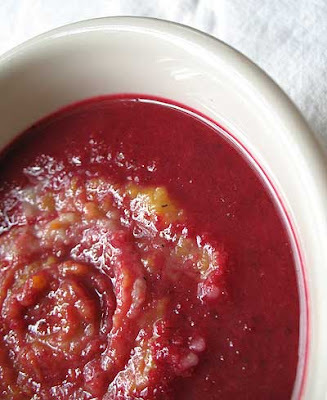 I have a great twist on chicken soup that helps you use left over chicken and the tops of beets. Instead of cranking open a lackluster can of chicken soup or spending hours cooking a pot of soup on the stove, just follow these easy steps to make a flavorful chicken soup that will leave you satisfied.